Is there a Morning Assembly at your school? We have had a Morning Assembley at a gym once a week. Morning Assembley starts at 8:10 am. If you are late for that, you have to stand at the corner. Morning Assembley has been a very important thing for Kaichi Nihonbashi Gakuen junior high school students, because teachers are speaking about important things like this picture. For example, teachers speak about problems in one week and this month’s target. If we don’t listen carefully, we can’t understand what teachers are saying. So, we must be quiet and listen to the teachers. Do you think that Morning Assembley is good? Morning Assembley has made my personality better, so it is very good. For example, we think about solutions to the problems. Accordingly, we can think deeply. Hello! 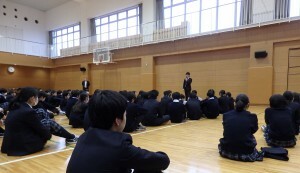 Do you know Japanese school’s homeroom? What is Japanese school’s homeroom? 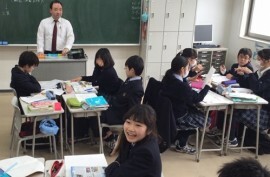 Japanese school’s homeroom is different from overseas homeroom. Japanese school’s homeroom at 8:20 starts and end of 8:30 of every morning. Homeroom teachers of my school are Japanese or foreigners. Please look at this picture. For example, my homeroom teacher’s Jason. He is from Canada. Students are listening to his speech. He usually says many jokes in the homeroom. So, I can enjoy but Why does he do homeroom?At first, I couldn’t understand his English in the homeroom. My homeroom teacher speaks English many vocabularies but I can understand. So, homeroom teacher must be Jason. By the way, Students must speak 3 minutes every day. I always listen to speech in the homeroom. So, homeroom of my classroom is very nice. Welcome to Kaichi Nihonbashi Junior high school! All Japanese school has a basic subject and a unique subject How about Kaichi Nihonbashi (KN)? KN has a unique subject philosophy! We make the circle and we think about many questions, but this is very difficult because even experts can’t find the answer. For example we think about “Can we predict the future?” We share ideas so I get many ideas and we became thinker.We have to think very much during philosophy classes. My elementary school didn’t have a philosophy class and I had no chances to think. Therefore I was not a think about philosophy but my junior high school KN has the philosophies class so I could be a thinker. I think I need to practice about philosophy but I think I can better than now. And I think my classmates think many times in this class too! Hello. What subject do you like? I like social studies. So I will explain about social studies. I think social studies class of this school is very valuable. How do you learn it? Our classes are different from other junior high schools in Japan because we don`t use textbook. However we learn by inquiring and discussion. Please look at the picture. We are doing discussion. We are discussing about countries of the world and talked with my classmate a president election in America. We should say our opinion in class because If we don`t say our opinion. We can`t further classes. By the way exam is very difficult because we write long essays in the short time. I think our classes are useful in the future. Discussion is important and fun!! So I like social studies!! Please come this school. Please lookup at picture. This is lunch time of my friends.How long is the lunch time in your school?In Europe, the lunch time is very long, because lunch is the main meal.But the lunch time at our school is 40 minutes.Also, most of the classmates bring packed lunch to school.And we can eat lunch in the classroom or in the lounge. Then after we finish eating our lunch, we are free till the end of the lunch time.For example, boys play sport in the gym and girls are clamoring in the classroom.I usually enjoy chatting with my friends in the terrace. The lunch time has a positive impact on me, because I need refresh to relieve fatigue of morning lessons. By this, I can concentrate on my studies in the afternoon. We enjoy eating and talking in the lunch time with our friends. I feel that it’s very important because we can speak a lot and we can eat delicious lunch. We have brought our own “Bento”. Some people buy “Bento” at a store or the school shop. “Bento” means box meal. What is in the “Bento”? Look at the picture. They bring rice balls, sandwiches, side dishes and fruits. Some people bring soup and noodles. In some countries students bring sandwiches. We eat together by putting desks together. Japanese and other countries are different kind of lunch so the influences are different. Japanese students eat at a classroom or at a lounge. Look at this picture. Students eat at class room and use a chair and a desk. In some countries student eat at outside or at cafeteria. If eat outside, sit on the floor. If you come this school you can enjoy this school lunch time! What subject do you like? Do you like Japanese classes? I will explain about our school’s Japanese class. Our school’s Japanese class is very hard. I have two reasons about it. First, students write many essays.If you are in IB class, the essay is very important because the essay decides your record. However, examination doesn’t has essays but it has many Kanji. Second, we have three Japanese classes. They are“Shosha”,“Kokugoenshu” and “Kokugo”. “Shosha” is calligraphy and writing kanji. “Kokugoenshu” is grammar and practice. “Kokugo” is usual Japanese their own reading books and writing essays.We write many essays. So We can write opinions.It’s useful in my near future because essays tell to me very important things. Hello. What subject do you like? I like science. 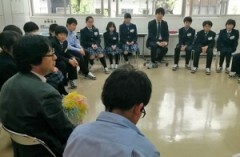 There are four characteristics of the Kaichi Nihonbashi’s science class. First we think by ourselves.Second we study actively in class. Third we make questions and answer ourselves.Fourth is IB. IB is very good program. These are different from the other schools. How many science class do your school have? We have two science classes. Their name is science one and science two. Science one is experiment. For example, I experimented with carbon dioxide（CO₂）. Science two is observation. For example, I observed flowers and locks. My school’s science class has good influence on me. I can write reports and essays about science because I am studying in the IB class. I enjoy studying in the science class because my science teachers are kind. Before I don’t like science now, I like science. Thank you. Do you like free time? Free time is very important because it’s good relaxation. Free time of our school consists of three kinds of break time. The first is 10-minute breaks between classes. We have gone to the restroom, prepare for the next class or talk with our friends during the break. The second is the lunch break. It’s a 40 minute break including time for lunch. We have spent the lunch break to play basketball and soccer, and talk with our friends. The third is after school. Although most of the students go to clubs, some of the other student study with their friends. If we had not have free time, we will be very tired. I think free time is indispensable. Spending free time makes me sociable. I’m always looking forward to talking with our friends. We have made many friends, and it can make our school great. Do you join clubs? 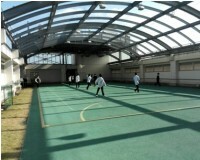 In Kaichi Nihonbasi junior high school, there are about 15 kinds of culture clubs and about 15kinds of sports clubs. I’ve enjoy the dance club. You can make new favorite clubs. Although when you don’t have club team or you don’t have activity place, you can’t make club. So you will save many people and activity place in can make club term. Every clubs start at 4:00 p.m. and finish at 6:00p.m.I have enjoyed club activity. I have dance club. This picture is school festival of dance club. I improve communicative skills in the club because I talk friends, juniors and seniors. This picture is the performance dance club. You can might discover new yourself. And I think that if you have club, you can interact with school’s seniors, so you can enjoy your school life. Hello! I will introduce the school’s club activities. We have a lot of clubs. For example soccer club, dance club, and basketball club etc. Club activities make use of your hobby. What can you do? I can speak English a little. I’m an English club member. We play a lot of games, watch English movies and sing many English songs. So, that’s very fun! By the way, my school also has a French club. We study French things, read many French books, watch French movie. The club has French things. My identity is that, I think club activities are important for my identity, after I joined the talk English very well. But join I changed English club. I talk English more that in. So, I can talk English well. And French club teach France’s good point. So, I want to go to France again. In this school, every classes gives us a lot of homework. So, we usually spend much time for doing homework. In most school, basic homework to student. Have unique homework such as report and big reading.This is very hard but it`s so excite because we can get know ledge and train making schedule. Since I`m busy, making schedule is very important for me. I want to be absorbed in my hobby and think about my identity.